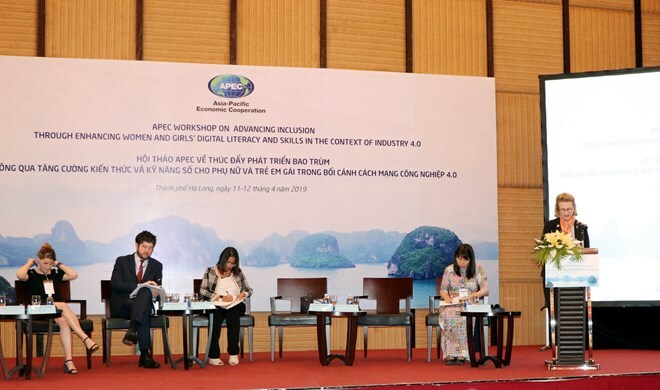 Quang Ninh (VNA) – An Asia-Pacific Economic Cooperation (APEC) workshop was held in the northern province of Quang Ninh on April 12 to seek ways to advance inclusive development through enhancing women and girls’ digital literacy and related skills in the context of the Fourth Industrial Revolution. Vietnamese Deputy Foreign Minister Bui Thanh Son said APEC has been contributing effectively to efforts towards gender equality. Its members consider female contribution a key solution to promoting sustainable and inclusive development to maintain dynamism and diversity in the region. He noted that in a digitalised world where 90 percent of future jobs require digital skills, equal access to technology and learning opportunities are a prerequisite for ensuring that women and girls benefit from Industry 4.0. This is also a critical measure to improve women’s economic empowerment for the sake of sustainable development. One of the key tasks now is training and re-training women and girls to equip them with technological knowledge and digital skills, enabling them to make full use of development opportunities in the 21st century. It is also necessary to seek solutions to narrow the gender gap, including the technology gap, eliminating gender discrimination, and removing relevant policy barriers so that women and girls can contribute equally and effectively to socio-economic development, Son added. At the workshop, participants, including representatives of APEC member economies and Quang Ninh officials, looked into employment opportunities and challenges facing women and girls amid Industry 4.0; the gender gap in the access to digital devices, technologies, and services; barriers to women and girls in the education of science, technology, engineering, and mathematics; and prospects of new technologies and social networks to empower women. They also discussed the enhancement of APEC’s efforts and put forth policy recommendations to bolster women and girls’ digital inclusion.